A new startup called unGlue wants to help kids better manage their time on connected devices. Just don’t call it parental control software, says co-founder and CEO Alon Shwartz. The idea, he explains, is to offer families a simpler solution for setting limits on screen time across devices, whether inside the home or away. Shwartz, a serial entrepreneur, came up with the idea for unGlue after selling his previous startup, document management service docstoc, to Intuit in 2013. After spending more time at home with his three children post-acquisition, he grew frustrated with having to manage how much time they were spending on devices, instead of homework or just playing outside and doing other things. At one point, he admits he even snapped — gathering up all the kids’ devices and placing them in a pile on the bed. His solution, unGlue, aims to tackle the parental control software market with a new angle: giving kids more control. The service works across devices, including smartphones, tablets, computers, smart TVs and other internet-connected devices. It also works whether on the home’s network or not. Most importantly, Shwartz argues, is that unGlue is not a “parental control” service, because it focuses on giving the kids more choice. Parents configure time limits on using entertainment apps like Snapchat, Facebook, Twitter, Instagram, YouTube and others, as well as mobile games, but when that time runs out, the internet is not disabled on kids’ devices. This is important because kids still need internet access for doing homework, checking the weather, or listening to music — the idea is to limit the time they spend goofing off. Parents decide how much time kids get per day, and then kids get to decide how to use it. Unused time goes into a “Time Bank” so they can build up hours by staying offline. In the unGlue Kids application, children can also request to earn more time by completing chores, at the parents’ discretion. “Kids are the ones that are hooked… they’re the ones using these devices,” explains Shwartz. “And it’s not even their fault… they’re fighting with the best minds in the industry that are set on having them scroll just a little bit more. Just one more like, one more picture, one more chat, one more Pokémon, one more level. And they’re losing,” he says. UnGlue is also different because of the way it works. While some parental control software has to be installed and configured on each device, or is limited to specific platforms, unGlue aims to work across any device. 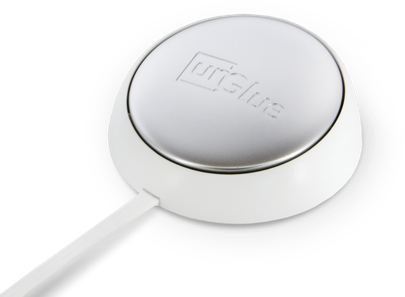 In the home, you can either run unGlue’s software on a connected (wired) desktop computer or you can buy a $30 dongle-like puck that connects to your router. Competitors like Circle with Disney, require a hardware device. On mobile devices that travel outside the home, unGlue uses a VPN solution for managing which apps can be used and when. While this does allow unGlue to cover all bases, VPNs are not always ideal. Some VPNs suffer from performance issues, and one TechCrunch staffer who tried unGlue recently found the VPN wasn’t consistently staying connected, which caused problems. These challenges could improve in time, given that unGlue has only been live for six weeks. That being said, parental control through third-party solutions will always run into problems because different platforms offer various limits on how much you can really control on a given device. This can lead to inconsistent experiences for end users. For example, when using unGlue on iOS, kids will be able to launch apps, but not view the content in them when their “time” is up; meanwhile on Android, unGlue is working to disable app launches altogether. What really needs to happen is for platform makers themselves — Apple, Google, Amazon, etc. — to make it easier for parents to manage what can be done on their devices and when apps can be used. There should not be all-or-nothing controls — lives are complicated, and require more nuance. Today, the platform makers’ own solutions are lacking — hence the need for third-party software. UnGlue is currently free, with plans to generate revenue in the future through optional, premium services, including perhaps, a family component to help get mom and dad off their phones, too. The Venice-based startup, co-founded by former docstoc employee Alexander Zherdev (CTO), has raised $1.5 million in seed funding led by Arena Ventures, with Amplify.LA, Baroda Ventures and Wavemaker Partners.